Fall 2010—Recent advances in MRI technology now offer the promise of visualizing localized Prostate Cancer (CaP). Unlike all other major cancers, CaP has proven difficult to image when still localized. Our mission here is to try to bring prostate imaging to clinical utility, using the new Artemis device to convert MRI findings into a practical guide for the patient. In a biopsy, a potentially lethal CaP lesion may be difficult to distinguish from one of the small insignificant cancers, which are far more prevalent than the lethal ones. That distinction is important, since the former should be treated, while the latter can be simply observed ("Active Surveillance"). Improved CaP imaging and targeted biopsy will help resolve the dilemma. Today's challenge of localized CaP is diagnosis and treatment of clinically-important tumors. Diagnosis is hindered by lack of an accurate screening test; the foibles of PSA testing are by now well-known. Several new tests for prostate cancer, such as PCA3 and proPSA, are on the horizon and appear promising, but are not yet fully validated or approved. Thus, at present approximately four men must undergo biopsy to find one with cancer, and not all cancers found are clinically important. Frequency of the unimportant tumors was defined by Sakr and the tissue characteristics described by Epstein and colleagues in the 1990s. Tumor volume is also a critical factor, with lesions less than 0.5 ml unlikely to cause harm. At least half of all prostate cancers diagnosed today are believed to be innocuous; some men with 'low-risk' CaP now undergo active surveillance, rather than immediate surgery or radiation therapy. Others may in the future be candidates for focal therapy (a la breast tumor lumpectomy). Prostate biopsy is the only proven method to diagnose CaP. The evolution of prostate biopsy over the past century is shown in the chart below. Remarkably, little has changed since Stamey and colleagues introduced the trans-rectal ultrasound guided technique (TRUS) in the mid-1980s. The major difference is that local anesthesia is now used and an increased number of cores are now obtained. Otherwise, in an era of rapid change in all aspects of medicine, the prostate biopsy is not much different today than it was several decades ago. Thus, advent of Artemis, an electronic imaging device—to aid systematic and targeted prostate biopsy, to guide and record biopsy locations, and to fuse MRI images with real-time ultrasound—has been received with keen interest. The manufacturer of the Artemis device, Eigen Corp. of Grass Valley, CA was granted FDA approval to market the product in May, 2008. Modified from Silletti et al, "Prostate Biopsy: Past, Present, and Future. Artemis was the Greek goddess of the hunt; the name has been applied to convey the cancer-hunting mission of the new device. The concept of the device derives from work over the past decade at Robarts Research Institute in London, Ontario, Canada, under the direction of Aaron Fenster, Ph.D. At Robarts, a prototype was built and described in 2008. The Eigen Corp. has licensed the patents from Robarts and obtained marketing rights. The current commercial version of Artemis is shown here and is likely to undergo changes (i.e., upgrades in hardware & software, miniaturization) in the future. The Artemis device consists of 3 main parts: a tracking arm, a monitor, and a work station. 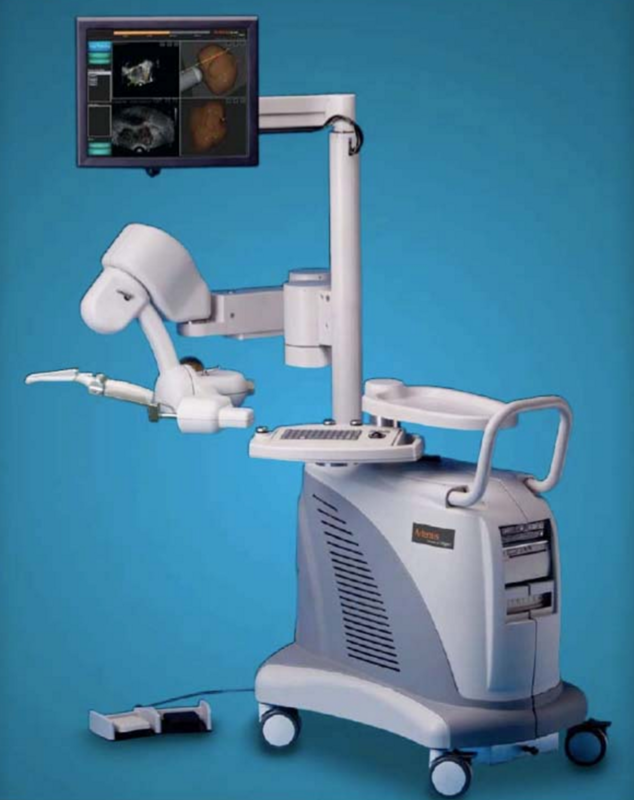 In brief, a conventional ultrasound unit is used to image the prostate trans-rectally. 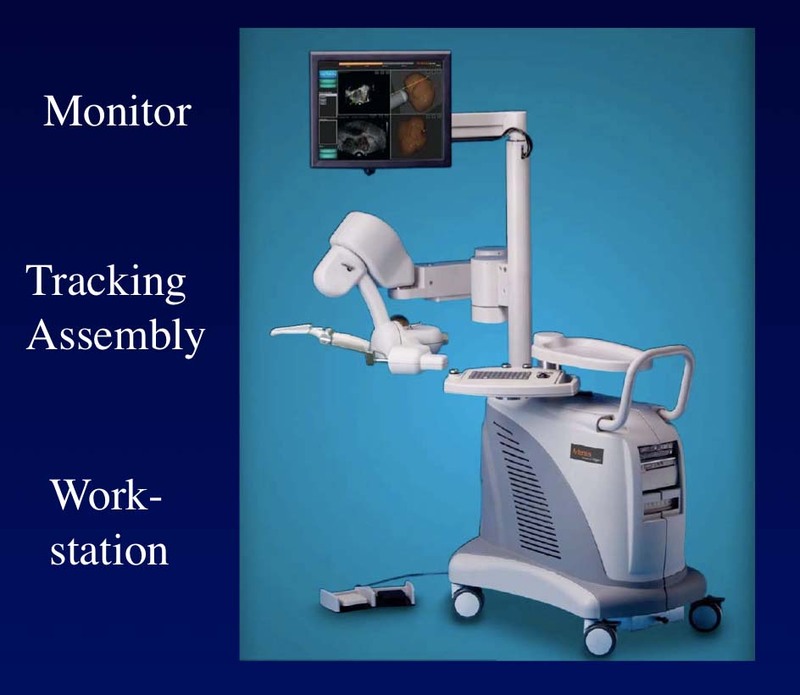 The tracking arm attaches to the ultrasound probe, allowing a capture of the scanned prostate by the processor. From the ultrasound feed, a 3D reconstruction of the prostate is created on the monitor in a near-realtime manner. Prostate biopsy is performed systematically using built-in sites, or, targeted biopsy may be perf ormed, if areas of interest are known. MRI studies, obtained in advance, may be loaded into the device for fusion with the ultrasound images, allowing areas of interest on the MRI to become TRUS-guided targets. Targets and biopsy sites are captured and stored within the 3D model and may be used for future re-call. MRI, particularly multi-modal MRI using a 3 Tesla magnet, may identify some prostate tumors not apparent with TRUS. Thus, we have adopted a practice of obtaining MRI with diffusion-weighted imaging and dynamic contrast enhancement prior to selected biopsy procedures. In the Artemis, fusion of the stored MRI images with the real-time TRUS images often provides a target for prostate biopsy, as in the example shown. The Artemis device was approved by the U.S. FDA in May, 2008 and a few weeks later was exhibited at the Annual Meeting of the American Urological Association in Orlando, FL, where we first learned of it. At UCLA over the next several months, an evaluation of the device potential was undertaken, culminating in detailed discussions between the UCLA Urology Department and the Eigen Corp. A test-site agreement was drawn; and an Artemis device was delivered to Clark Urology Center on March 23, 2009. 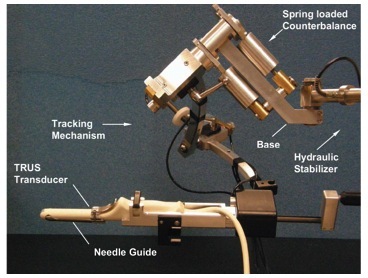 A presentation of the initial Artemis experience at UCLA establishing the biopsy-tracking accuracy of the device, was presented at the Annual Meeting of the American Urological Association, San Francisco, CA, May, 2010. As of August, 2010, more than 150 men have had an Artemis-guided prostate biopsy at UCLA. Apparent low-risk prostate cancer interested in Active Surveillance. All targeted biopsies are performed in the UCLA Clark Urology Center on an outpatient basis. We have now begun clinical trials involving the use of a laser to ablate and treat the detected cancer cells, with results indicating the potential for our system and treatment to improve upon standard of care by about 300%. At UCLA, a coordinated, multi-disciplinary effort has been organized to advance the understanding and application of targeted prostate biopsy. Further, world-class advisors (Fenster, Barentsz) from Canada and Holland have generously donated time and energy to the mission. In addition, scientists from Eigen Corp. (Kumar, Narayanan) are also actively involved. T.A. Stamey, et al. "Localized prostate cancer. Relationship of tumor volume to clinical significance for treatment of prostate cancer." Cancer. 1993 Feb 1;71(3 Suppl):933-8. W.A. Sakr, et al. "Age and racial distribution of prostatic intraepithelial neoplasia." B. Turkbey, et al. "Documenting the location of prostate biopsies with image fusion."